Super Star Mahesh Babu is currently active in the promotion of the film SPYder. The actor is also busy with his another film Bharat Ane Nenu. Though Mahesh is not being able to attend the shoot of the film, the makers are continuing with their new schedule. 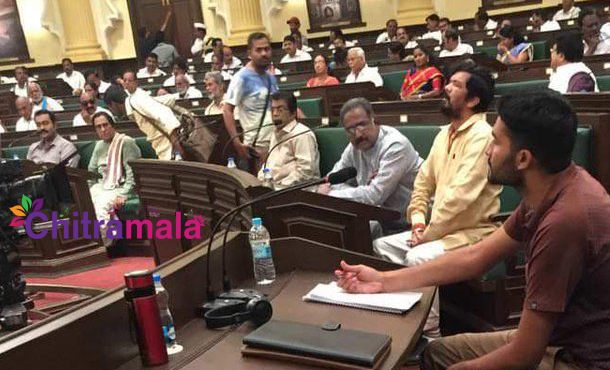 Apparently, a picture from the sets of the film has come out now where the assembly session is going on. Mahesh Babu is rumored to be playing CM in the film, and the makers are canning some sequences regarding the swearing oath ceremony. In the leaked picture, we can see the actors like Jeeva, Posani, Banerjee in the front row. The pic suggests that Posani is doing something in the scene. Looks like the film is a solid political entertainer that will be having a big release. Koratala Siva is the director of the film.